This thread is the result of reading about Johannes' first performance. So I thought it may be interesting to hear from other member's on their first "gig", or playing in a weird/strange place, your most memorable time. I've had a few, but only two I'll mention here. It's funny how long term memory works, it's hard to remember what we did two day's ago, but then again we can remember where we were and what we did say 20-30-40 or more year's ago. It was the summer of '1949', (I was almost six) I came down with pneumonia, of course it was a Sunday evening when thing's got worse (always). My mother didn't know of any doctor's around who were open at that time of evening and the hospital was mile's away. She called the Royal Oak, MI, police department for help. They refered her to a doctor, she called him, he came to our house on a Sunday evening and confirmed it was pneumonia, he gave me a shot of penicillin and some pill's he had in his bag and said I probably wouldn't have survived through the night and that he wanted me in his office two day's later. A couple week's later I had to go back for a follow up call, somehow, he found out that I played violin, he asked if I would bring it with me and play for him and his nurse in his office, and so I did. I don't recall what song I played, but I think he was trying to get my mind off of that 3' hypo needle he was about to insert in my bumm, (I was terrorfied of needle's). This was my second experience at performing before anyone other than playing in the school orchestra and didn't have to play solo. My very first experience of performing and most memorable, was several month's prior to the doctor's office. I played a "gig", lol, at a "Howard Johnson's" restaurant. 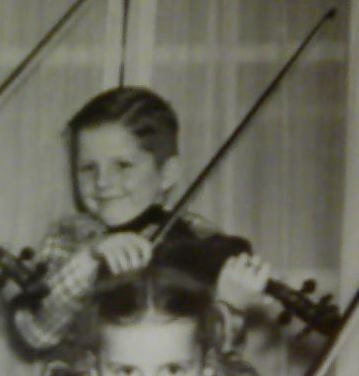 My mother was a waitress at one of their location's and the kitchen help and other waitress's knew I played violin, they wanted to hear me play. Mom made a special trip there with me and my violin, in our '1939' Pontiac coupe, it was her day off. I remember the kitchen where I played, I could just barely see the top's of the stainless steel counter's. I played, "Long, Long Ago" and for that I received a standing ovation, as the help had to stand anyway, they were all working. Beside's the applause for my performance, I received one of Hojo's 28 flavor ice cream cone's, a two scooper which had to cost at least 25¢. I guess that wouldn't be considered professional status as I never have reported the cost of the cone to the IRS as income. So let's hear from other's who may have had a similar experience, including you, Pierre, (if you have time). Thank's, Naska..... it was a loooooooooonnng time ago.